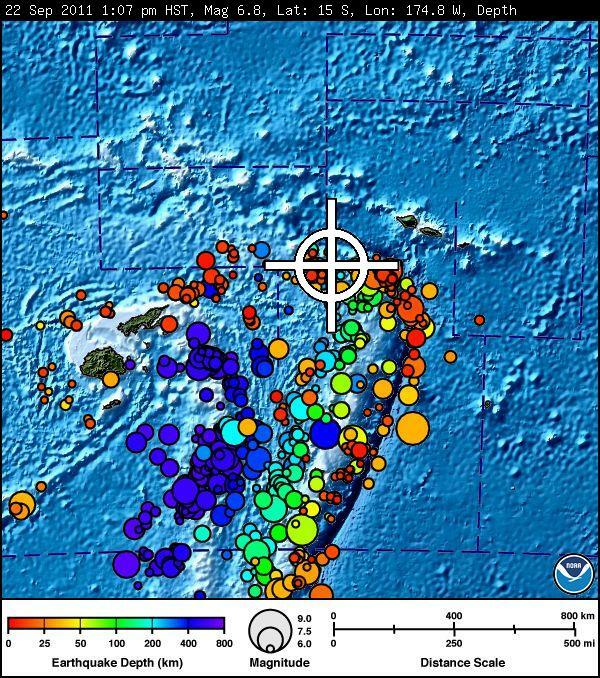 Initially magnitude 6.8, later downgraded by USGS to 6.2 and finaly earthquake hit Tonga archipelago at 23:07:03 UTC. The epicentre was located 382 km (238 miles) NNW (338°) from Neiafu, Tonga, 423 km (263 miles) WSW (244°) from APIA, Samoa (15.449°S, 175.293°W) at depth of 8.6 km (5.3 miles). There was no tsunami alert issued. The island Niuafo’ou is located in the southern Pacific Ocean between Fiji and Samoa, 574 km north of Tongatapu island group and 337 kilometers northwest of Vavaʻu. It is still considered as an active volcano. Niuafoʻou is a volcano located on an underwater ridge 190 kilometres (120 mi) west of the line of all the other volcanoes of Tonga. The island contains a steep-sided caldera; the rim is over 120 metres (390 ft) high, rising to a height of 250 metres (820 ft) at Mokotu. The coastline is rocky and steep with only a few stony black sand beaches. The only landing place on the island is the end of a lava flow at Futu, in the west. All the villages are in the north and east. Public places like the post office, telecommunications station and airport are in Angahā in the north, while a high school is located in Muʻa. The island ring encloses two lakes. The largest, Vai Lahi, is a crater lake 23 meters above sea level, 4 kilometers wide, and 84 meters deep. The lake contains three islands and a submerged island that appears when the water level drops. Vai Lahi is separated from the smaller Vai Siʻi (or Vai Mataʻaho) by a desolate landscape of sand hills. The island is covered by forest on the inner walls of the crater lake, and on the island's eastern and western slopes. Niuafoʻou has been an active volcano for thousands of years. In 1853, the village of ʻAhau was destroyed, killing 25 people. Lava flows from eruptions in 1912 and 1929 destroyed the village of Futu, cut off the harbor, and killed all the vegetation on the western slopes of the island. Other eruptions occurred in 1935, 1936, 1943, and 1946. The 1946 eruption was a particularly violent one and in December 1946 Niuafoʻou's inhabitants were evacuated and resettled on the island of ʻEua. ʻEua and Niuafoʻou share many place names, showing where the resettlers went to. The first groups of inhabitants were allowed to return to the island in 1958.
tonga, where is that?? not the canary islands off afica coast is it? ?